If you believe in the power of thought and will to bring about change and support the end of the massacre in Gaza, please visit this website – Freedom 4 Palestine.Watch the video and if you choose, as I did, share your thoughts for peace with the world in your photo. Why do men always think bombs are the way to settle disputes? If women ruled the world, I doubt we would have these problems. I like to think that, but they’d have to be women who don’t think like men. As Margaret Hatcher and Indira Gandhi are not exactly paragons of the feminine principles of non-violence and peace. 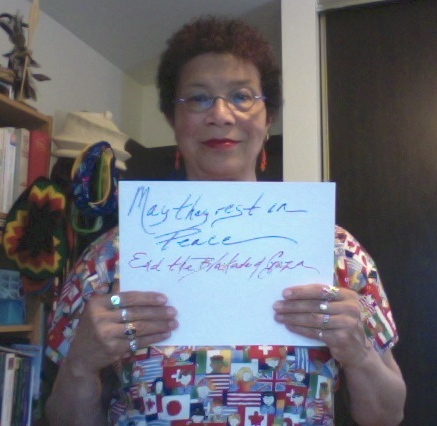 Thank you for sharing this powerful video and prayer for peace, Skywalker!